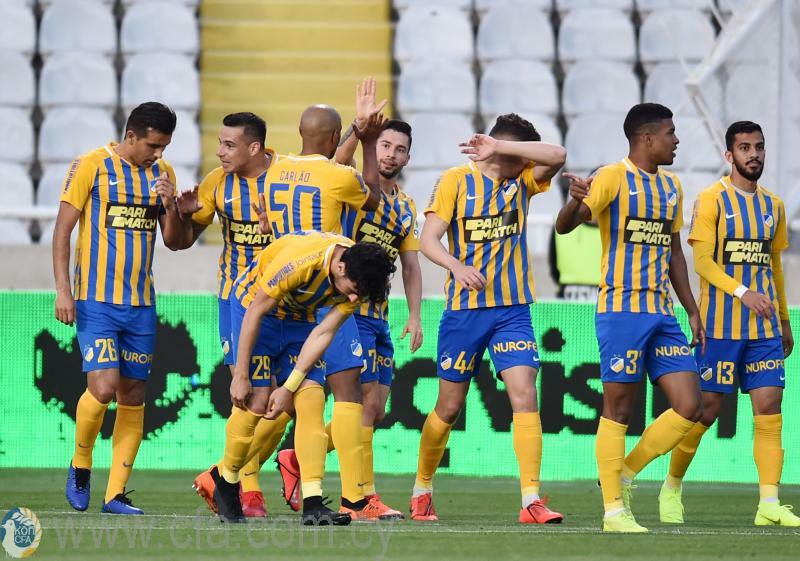 Apoel are flying high top of the table the Leaders are moving towards their seventh consecutive title after a 4-0 win over New Salaminato keep a four-point lead over second placed Apollonwho beat Omonia 2-0. Antonio Jacolis and one each by Mousa Al Taamari and Nuno Morais scored for Apoel. Apollon also had an easy afternoon 24 hours later as they overcame a lacklustre Omonia 2-0. Apollon’s goals came from Zelaya and Psychas. AEK led twice against AEL through Ivan Triscovski and Truyols only for Fidelis and Lafrance to bring the game level but 10 minutes from time Catala headed in AEK’s winner. A goal in the final minute of added time from Aleksandr Dovbnia gave Pafos FC the three points in a 3-2 away win against Alki.